robyn's reverie: Facelift Friday | Getting back in the swing of things! Facelift Friday | Getting back in the swing of things! Friends, it has been far too long. I have really missed this little blog of mine. But I have thoughtfully made some changes in my life and as a result, will have more time to blog. I'm happy to be back! Well, I meant to post this Friday, but as we all know, life gets hectic and I am slowly getting back into photographing, editing and writing up home decor projects and ideas. This week's facelift is a super fun and easy project that anyone can do. I knew I wanted something on it that would be textured and raised up off of the surface. I remembered I had a jar of gesso and the wheels in my head started spinning. 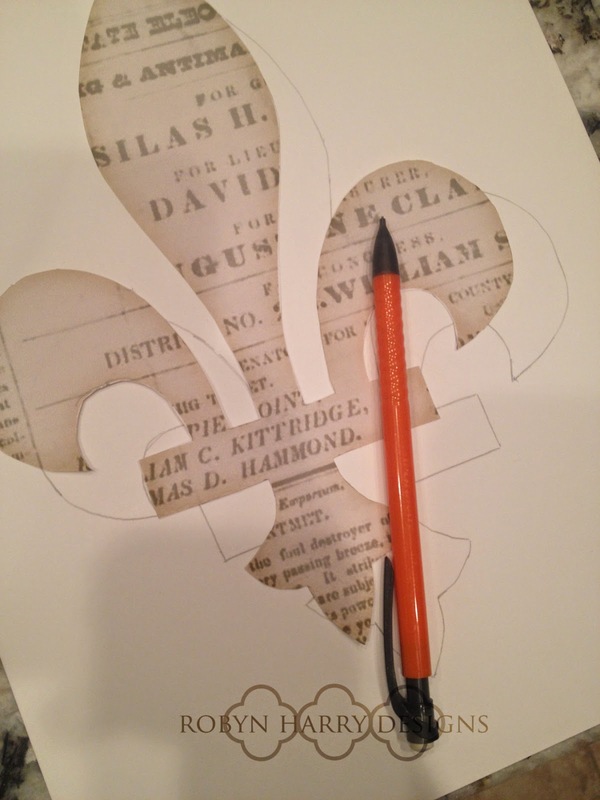 First I printed out a free image of a fleur de lis I liked. Next, I traced it onto a thicker cardstock and cup that image out with an exacto knife to create a stencil. 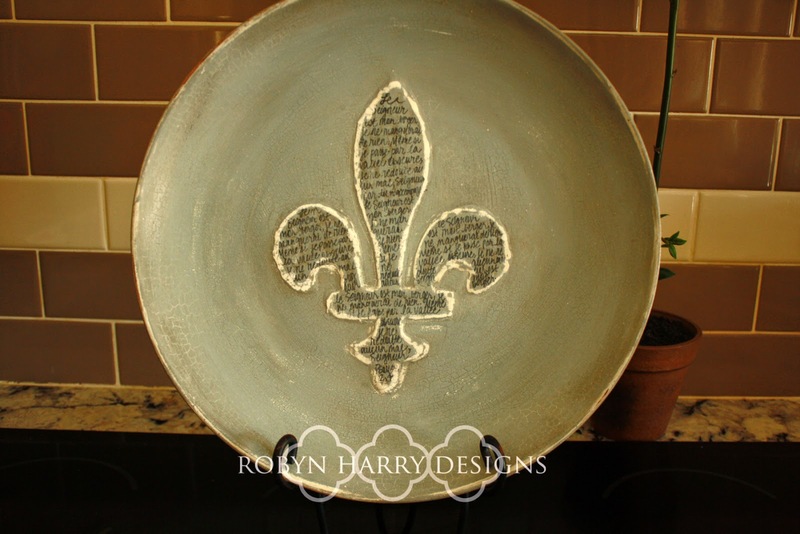 After taping the stencil to the bowl, I added a layer of gesso and let it dry. Next, I pulled the stencil off and just used the first layer as a guide. I applied quite a few more coats of gesso on top. I'm going to be honest and let you know this bowl was on my island for several weeks. Some people (hubby) got really tired of looking at it. 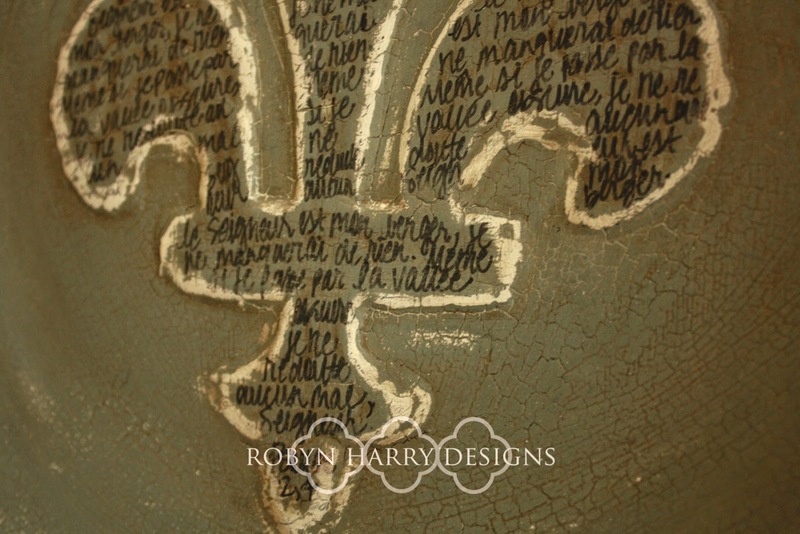 Once I was satisfied with the amount of texture and depth of the fleur de lis, I spray painted the entire thing with two coats of flat white. 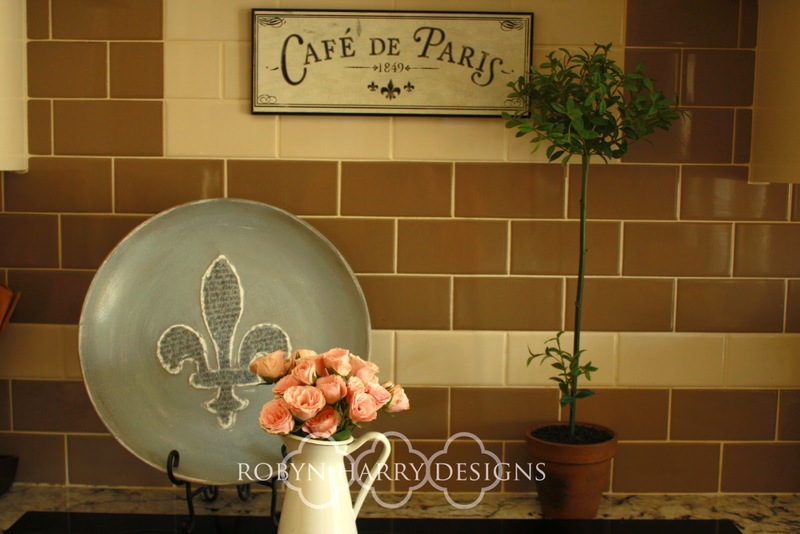 I wanted to use milk paint on this, but I knew it would have a hard time adhering to such a smooth, perfect surface. The spray paint was to give it some depth as well as something for the milk paint to adhere to. Next, I added one coat of Miss Mustard Seed's milkpaint in Shutter Gray. 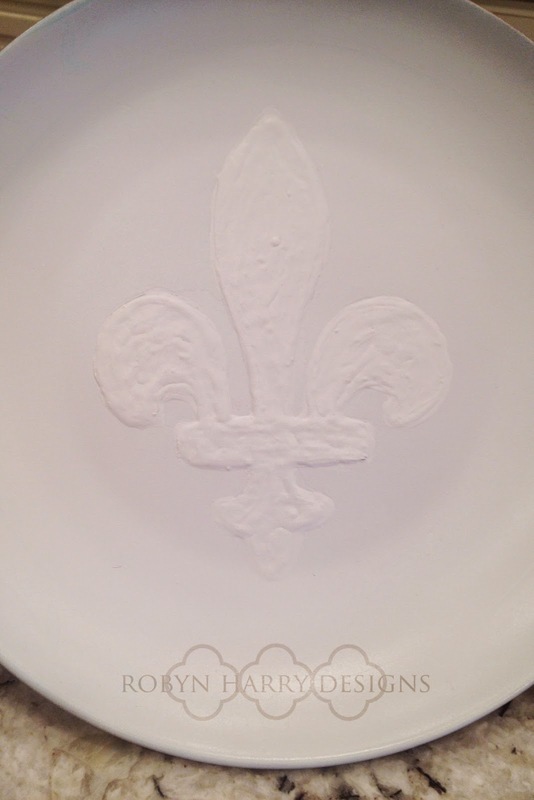 Once it dried, I sanded a bit around the borders of the fleur de lis to reveal the flat white. 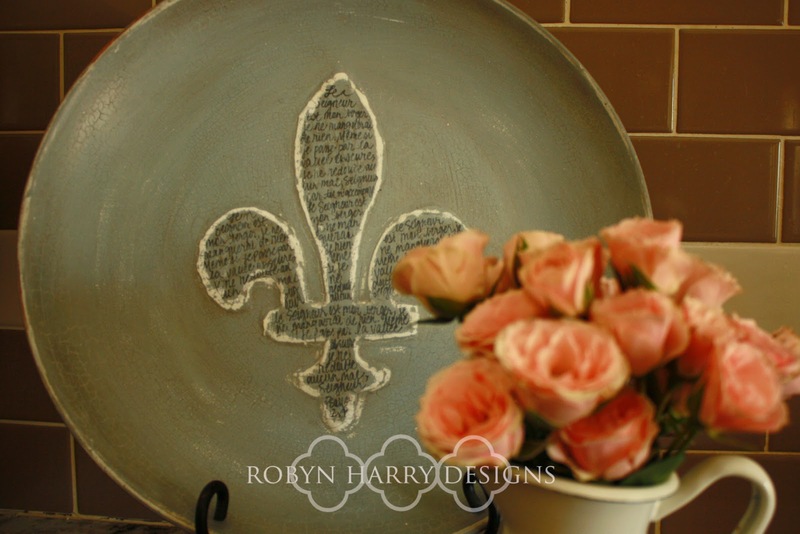 My plan was to use a large French script stamp I have and stamp only on the raised fleur. I'm telling you, I tried every technique possible and I just couldn't get it right! 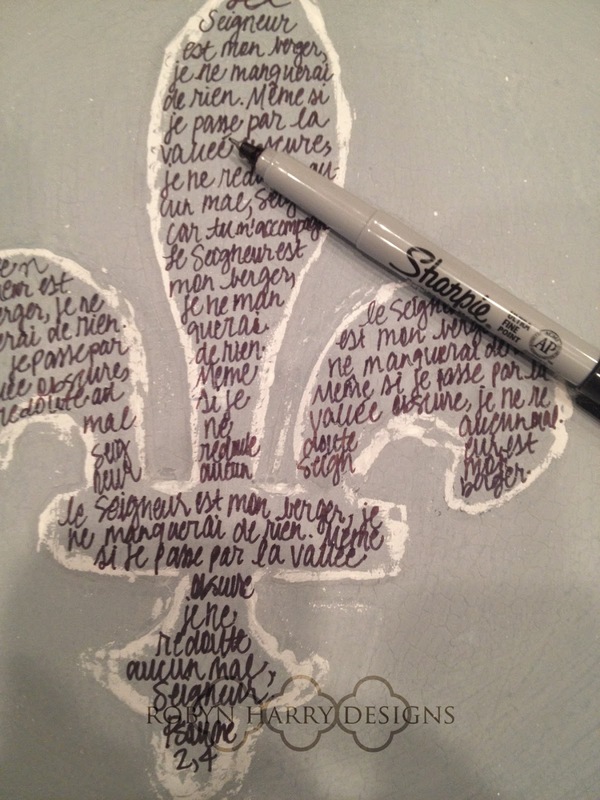 I finally resolved to handwriting Psalm 23: 2 in French. It's SO not perfect, but it will do. Finally, I used a very fine grit sand paper to smooth down the entire thing and rough up the handwriting a bit. I added a coat of MMSMP antique wax, followed by a coat of white wax. I love how it brought out the lovely crackle texture left by the milkpaint. 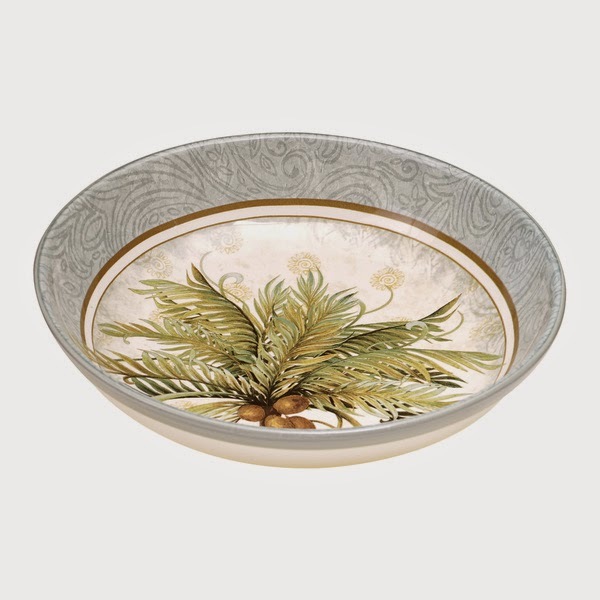 This bowl is very large and would make such a great accent piece in a kitchen, dining room, or bookshelves. The colors are all quite neutral, so I think it would be a great fit for any color scheme. All of the Miss Mustard Seed Milk Paint line is nontoxic, though I still wouldn't recommend using this piece for food. I think I'm going to put it up in my booth at Old Time Antiques. If you are local, you should absolutely check it out!